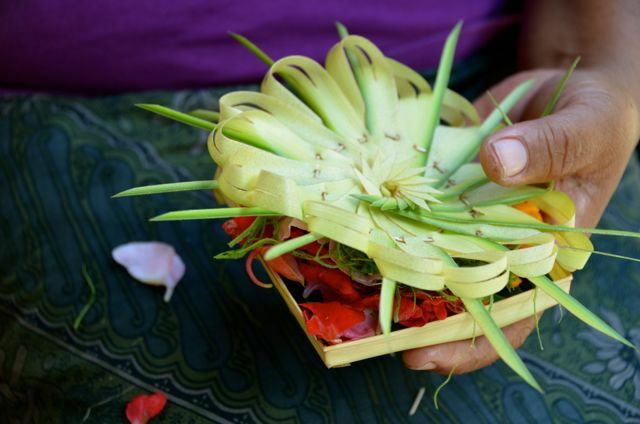 Canang is a small and square-shaped coconut-leaf basket that can overflow with a variety of brilliant flowers. 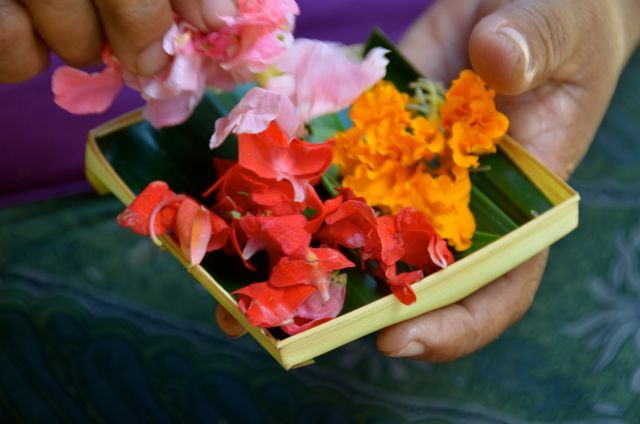 Sari means ‘essence.’ For example, a modest amount of money could make up the essence of a Balinese offering known as kepeng. One night while walking along the beach in southern Bali, we saw a canang sari waiting to be carried out to sea, along with a modest kepeng inside. 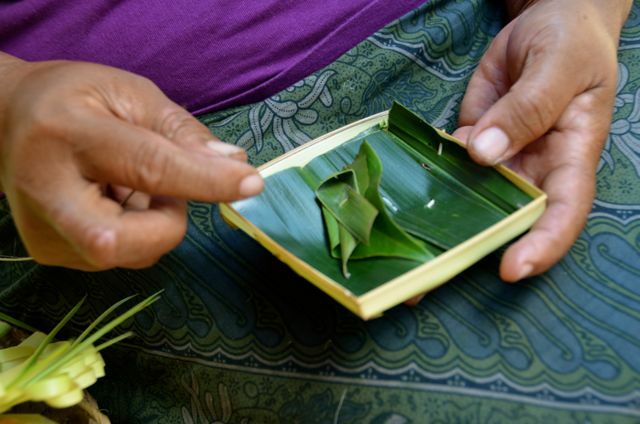 Many Balinese people make canang sari offerings on a daily basis. Nyoman crafts 100-150 per day, using all organic materials. This labor of love and devotion takes her approximately two hours. 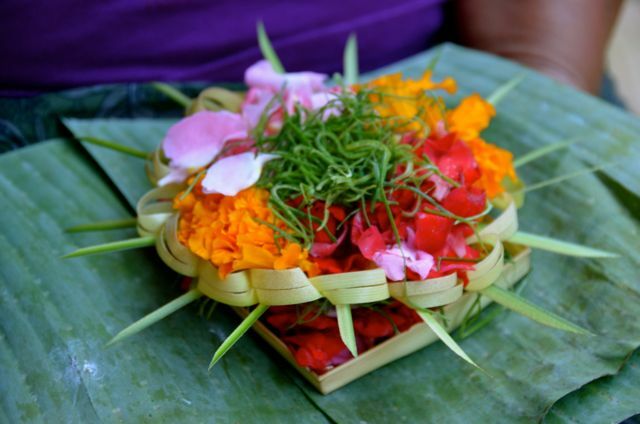 In order to make the canang sari, Nyoman uses mounds of vibrant flower petals. 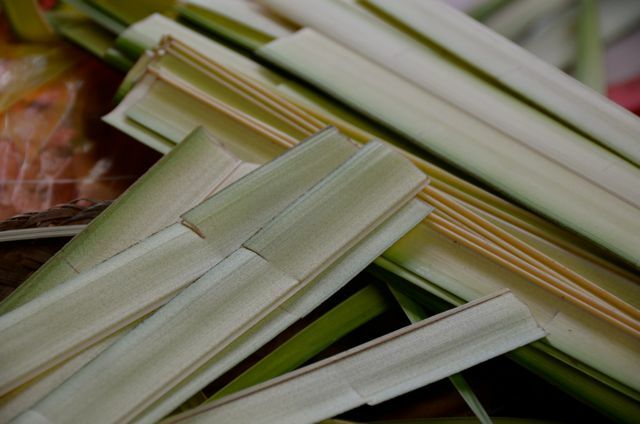 She also incorporates coconut leaves and bamboo, which is shaved in a toothpick-like thread. When I tried weaving this ‘thread’ through the many loops of the frilly basket, the session concluded with multiple snaps of the thread and giggles on my and Nyoman’s part. 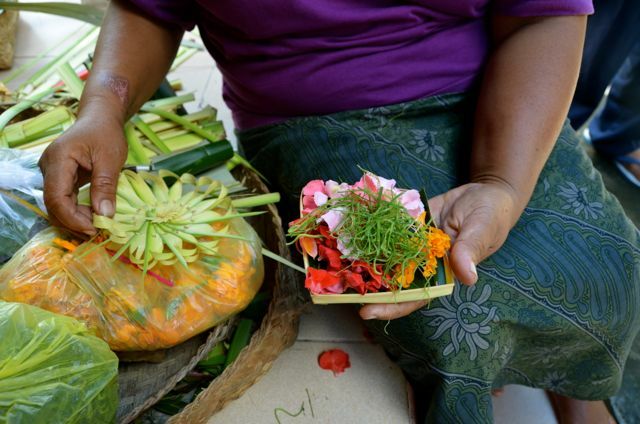 Canang sari embody Balinese Hinduism and the religion’s aim to make the world balanced through Tri Hita Karana. Parahyangan means ‘God’, Pawongan means ‘human’ and Palemahan means ‘nature.’ Tri Hita Karana is represented with a special three-piece component that is included in every canang sari. Nyoman instructed me to place this at the bottom, underneath the flowers. The philosophy behind the offering is self sacrifice. 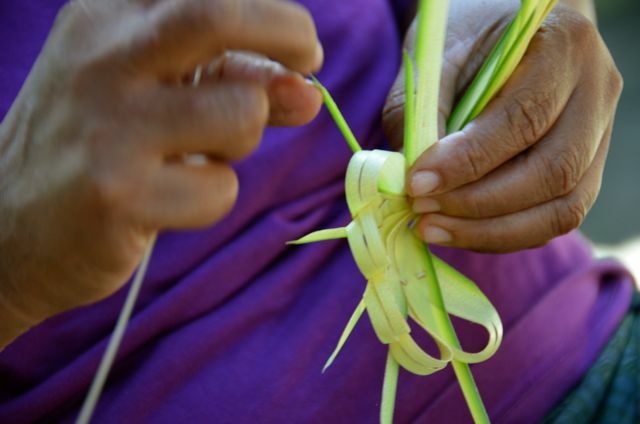 Indeed, it takes an extraordinary amount of time and effort to prepare canang sari. 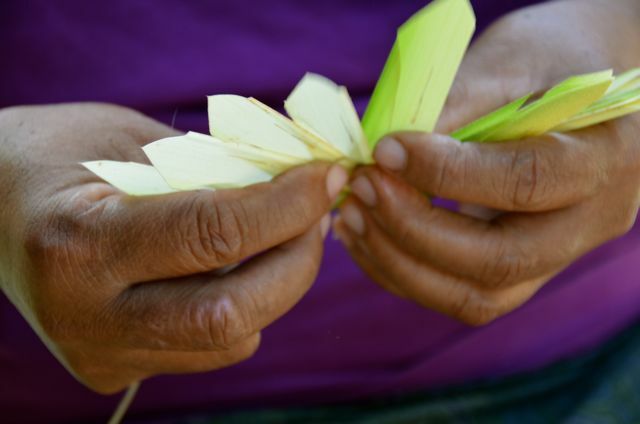 As Nyoman attested — by showing her calloused and cut fingers — the offerings can also take a toll on the crafter’s hands. After my lesson, as well as a playful interaction with Nyoman’s grandson (who loved the bear finger puppet we left him), we returned to our home away from home, Nirwa Homestay. 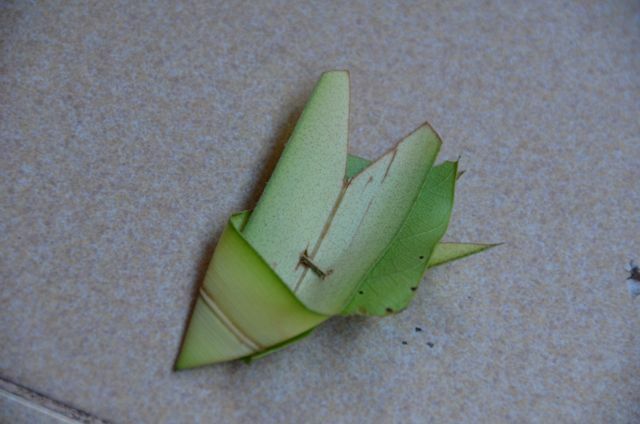 There, we left the banana leaf-wrapped offerings at the entry way to our room. It was a fitting way to say thanks for the wonderful people we have met in the Bali, as well as our special family and friends from around the world. 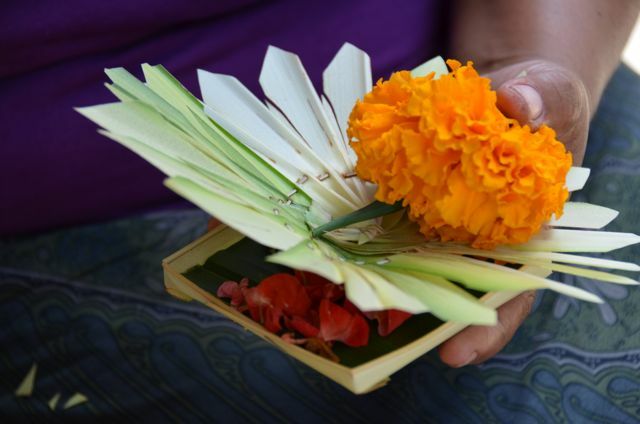 The Balinese believe that offerings should be created with a thankful spirit, and so it was fitting that I made my visit on the American Thanksgiving holiday. What a gift it was to have a master teacher show me the ropes. 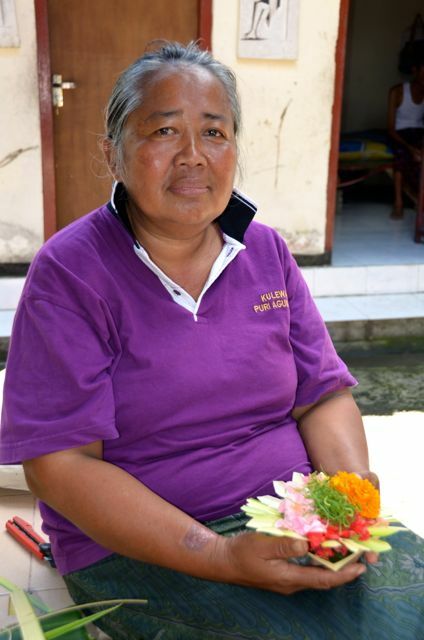 Ayu, our homestay host in Ubud, kindly introduced me to Nyoman and her family so that I could have this experience. We spent two weeks in Ubud, staying at the Nirwa Homestay (affiliate link). 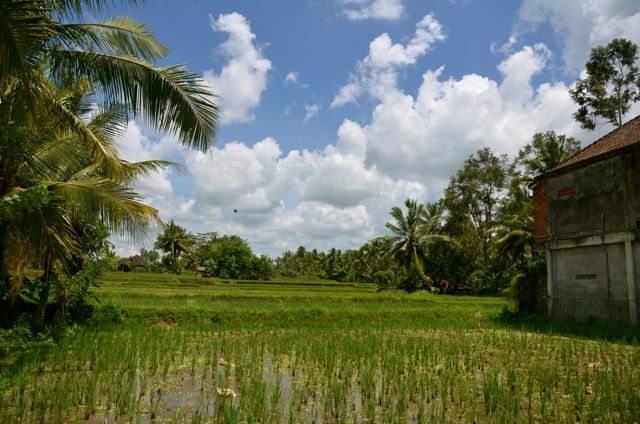 This lovely family-run guest house was surrounded by a panorama of vibrant rice paddies. Our soundtrack was that of nature: crickets, boisterous roosters, and babbling canals. If you stay at the Nirwa, be sure to order Ayu’s legendary green banana pancakes for breakfast. Need more inspiration? See all my posts from Bali, Indonesia. Thank you. I appreciate your story on the culture. 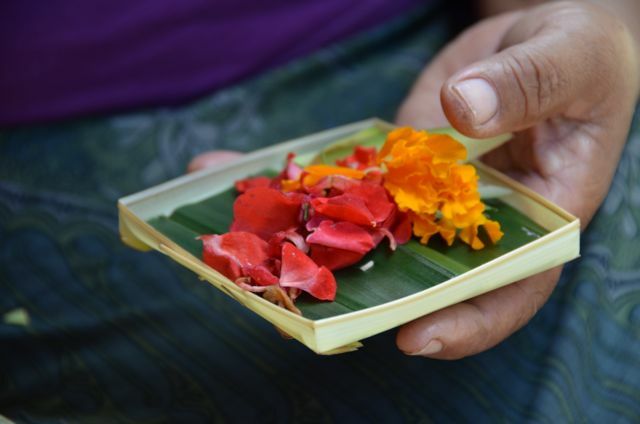 It’s nice to understand the meaning of the offerings. Victor, after learning how to make the canang sari, I valued them not only for their beauty, but also for all the hard work that goes into making them. 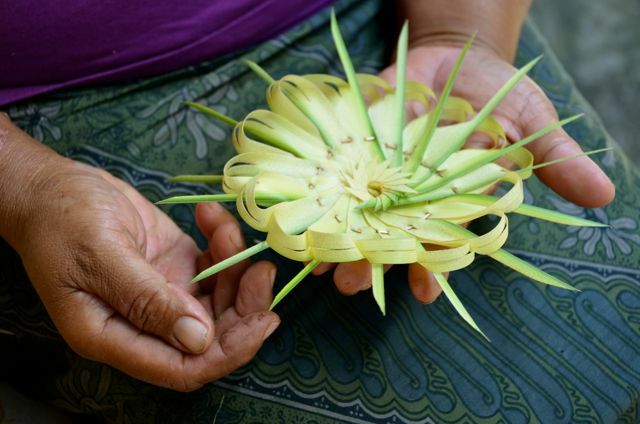 Balinese ladies (of all ages) craft them, and make a little business out of selling them to the locals whose busy jobs don’t allow them time to hand-craft them anymore. Our guest house owner, for example, buys her canang sari from the woman I featured in this blog. Fantastic story, and what a great experience. I love that third shot amongst a collection of beautiful photos! 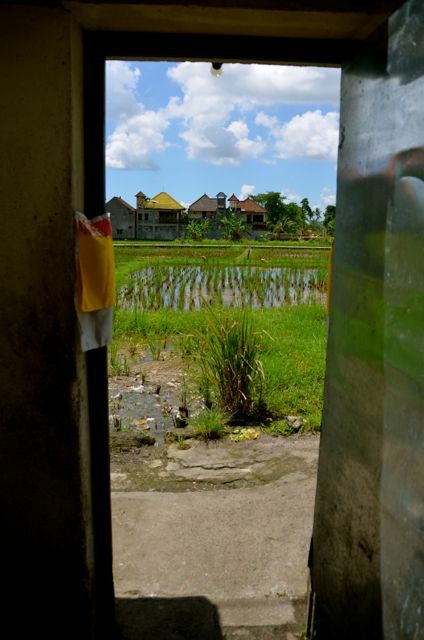 The western world could learn a lot from countries such as Bali, especially about appreciating the important things in life instead of the consumer driven materialistc world we live in. Beautiful culture – and pictures. Beautiful post. 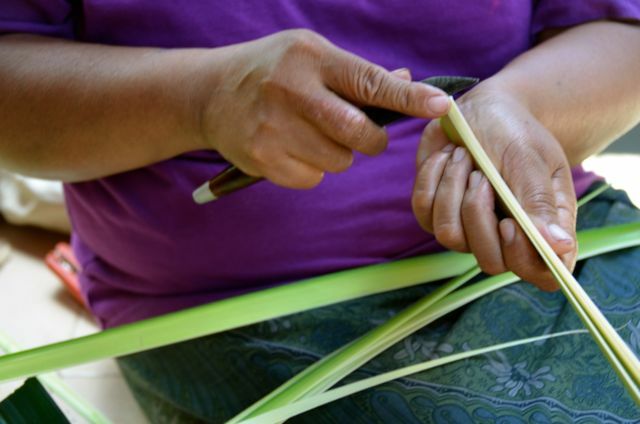 I love how you paid respect and tribute to the cultural and spiritual significance behind this practice of making canang sari. Fantastic photos and writing! Hi Sara, it was so kind of our bed & breakfast host to introduce us to Nyoman so we could learn more about this ubiquitous custom. Several years have passed since we’ve been to Bali, but I certainly miss seeing these delicate offerings scattered along pathways. I hope to return someday. Thanks for your kind words, and wishing you many happy travels!